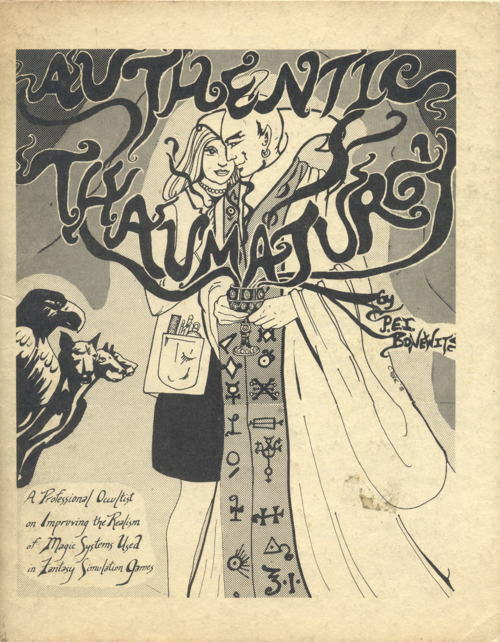 This is a general use supplement for use with any role playing game, featuring “a professional occultist on improving the realism of magic systems used in fantasy simulation games.” …I suspect the “professional occultist” part is the kind of thing that gave easily-panicked parents the vapors during that brief period when the evil influence of role playing games was clearly what was wrong with today’s youth, along with their zoot suits and their jazzy music. Speaking of which, during that whole anti-Dungeons and Dragons hoohar that inspired, among other things, this…I never heard anyone bring up the point that (with the version of D&D that existed at the time) the ideal roll when rolling up character stats with the six-sided dice was three sixes. I mean, c’mon, that’s totally a gimme right there. Okay, I’m sure somebody had to bring it up, but never within earshot of me. I did hear one really great “evils of fantasy role playing” thing at the time, but I already talked about it here so you can go back and relive the memories of Progressive Ruin Classic at that link, if you’d like. It turns out that Isaac Bonewits was as close to the real thing as reality may allow. (“Was” in that he died in 2010.) He was a big, controversial name in the pagan scene, one of those people who had a lot of influence early in his career, in the ’70s and early ’80s, and then had more and more feuds and got increasingly isolated from all those darned schismatics and heretics. When he died, pagan friends of mine compared the tone of the arc of his career to Freud’s. The Authentic Thaumaturgy rules are, by the way, an utter hash. They try to work out mana costs based on physics-level costs – so, for instance, a fireball is hugely expensive because it’s a hell of a lot of energy, while making a simple glow is much cheaper. A lot of typical spell effects, surprisingly enough :), don’t make much sense in those terms. When someone (Steve Jackson Games, I think) got the rights to reprint it, Bonewits himself acknowledged in an introduction that it was sort of a young man’s folly and not what he’d do if he were to take another run at the concept. Some of these goodies may sell for fairly nice prices. A term to use in searching for mention of prices paid and received would be “old school revival”, the handle used by folks out to game in a deliberate evocation of Gary Gygax’s early personal style. James Maliszewski’s blog Grognardia has a bunch of links and is a well-regarded hub for that scene. I know you have a fondness for gelatinous cubes, but are you familiar with shambling mounds? Pretty much the go-to AD&D swamp monster, and yeah the name makes me giggle. I swear I’m a grown man now. Spoony (an online reviewer) did a review of M&M, as well as another movie, called Skullduggery, which… has less to do with roleplaying and more to do with serial killers in cosplay, or so it seems. I’m very lucky, I never had to worry about my parents flipping out about roleplaying, because, 1) I got into it at seventeen, 2) my father actually played first edition and was enthused to hear I was playing it. My boyfriend has been roleplaying in some form or another for much longer, and his father too played D&D (and was noted famously for his line, ‘okay, next time YOU bash the balrog, and I’LL climb the tree!’). It’s nice to have supportive parents, some of my friends weren’t so lucky, and one of them lost about 5K$ worth of books to her mother deciding to just destroy her property, but her mother had *other* issues too. On the subject of SHAMBLING MOUNDS, back in 2009, I blogged an entry with pics of a cool rubber Shambling Mound figure from my collection. I own it because it bears such an uncanny resemblance to Man-Thing. Wow, Sluggo sure grew up to be powerful! “Mazes and Monsters” featured my old friend Louise Sorel, who played Rayna the Robot Girl in season three of Star Trek! I remember “Mazes and Monsters” fondly. It was silly, it was unbelievable, yes. But as an isolated kid who was into role-playing games, I was psyched as hell that there was any kind of TV show or movie about it at all. Less fondly, I remember flipping through channels one day in the 80s and catching a 700 Club episode that claimed that D&D was “EVIL” with Pat Robertson citing the “trap the soul” spell as proof of its link to Satan, blah, blah, blah.